We will hold FPT'18 conference at Tenbusu-Naha hall, which is located at the center of Naha downtown. The location of the conference venue is very convenient. The Tenbusu-Naha hall is just along the International street, which is the busiest and most popular street for tourists. There are many restaurants, hotels, shops, bars, and other facilities in a walking distance. Okinawa is far from the Japan's main island, but it is easily accessible. We have a lot of domestic flights from major cities in Japan, Tokyo, Osaka, and Nagoya, for example, so you can easily travel to Naha by indirect flights. From Asian cities such as Seoul, Shanghai, Taipei, and Hong Kong, we also have direct international flights to Naha. Train: Please take Mono-rail train and get off the 8th stop, Makishi Station (300JPY). 16 min from Naha Airport to Makishi Station, and 6 min walk from Makishi Station to Tenbusu-Naha Hall. 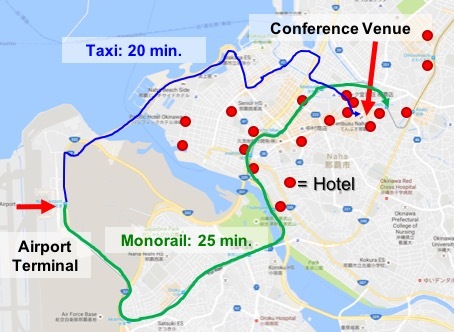 Taxi: It takes only 20 min from Naha Airport. You can find taxies easily in front of/around airport. 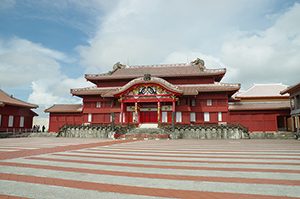 This is Shurijo castle of the Ryukyu kingdom, which was declared as a world heritage site by UNESCO. Its architecture is influenced by both China and Japan. In 2000, we had G20 summit in Okinawa, and its dinner party was held at this castle. 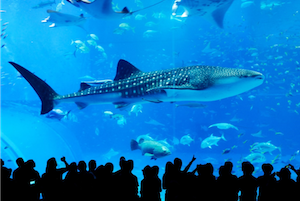 Churaumi Aquarium is one of the popular places for tourists. The aquarium with the world-largest class water tank would provide you a fantastic experience with big rays and whale sharks. You can also enjoy many facilities in the park where Churaumi aquarium is located. Kokusai Dori means International street in Japanese. There are many shops still open until midnight. 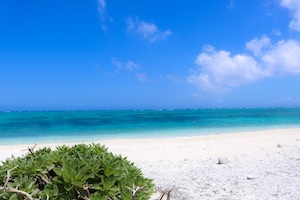 You can also enjoy nature in Okinawa, including beautiful beaches. Although it is not sufficiently hot to swim in the sea in December, such natural scenery would make you feel completely refreshed. 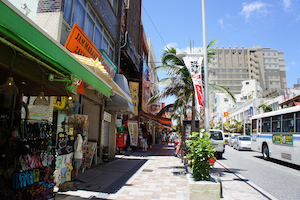 In the Naha downtown, you can enjoy the food and culture of Okinawa. In addition to Okinawa cuisine including this Okinawa noodles, we also have variety of Japanese food including sushi. 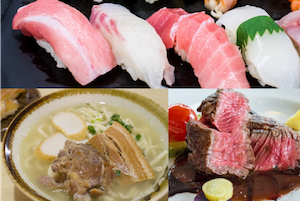 If you are not good at eating raw fishes, please don't worry. We also have very good streaks of Japanese beef. 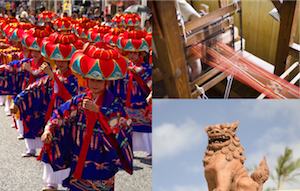 The image on the upper right is a traditional craft of Okinawa, which is used for clothes of traditional Okinawa dancers.